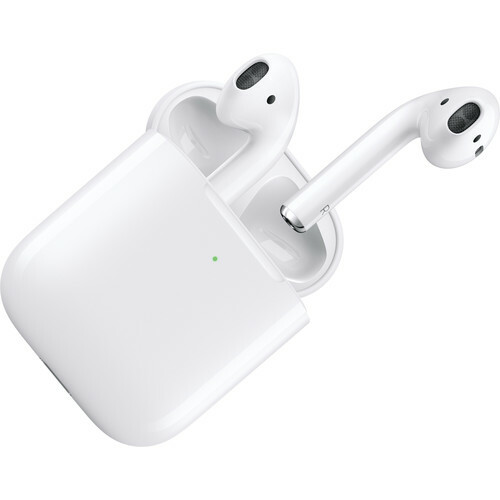 Access incomparable convenience and wireless charging with 2nd generation Apple AirPods with Wireless Charging Case, high-performance wireless Bluetooth earphones that use optical sensors and a motion accelerometer to detect when they're in your ears. A fresh Apple H1 chip provides a host of user benefits including increased wireless connection stability, faster device switching times, quicker call connection times, and voice-enabled Siri access. Plus, when playing games on your device, the AirPods deliver up to 30% less latency than the previous generation. Following a single-tap setup, these AirPods automatically turn on and maintain their connection to your iPhone, Apple Watch, iPad, or Mac computer; forget having to manually engage or disengage power. Enjoy music, answer calls, or communicate with Siri on your mobile device without having to pull out your iPhone. These AirPods automatically play audio as soon as you put them in your ears and pause when you take them out. A simple double-tap during music listening will skip forward. To adjust the volume, change the song, make a call, or even get directions, just say "Hey Siri" to activate your favorite personal assistant. Plus, when you're on a call or talking to Siri, an additional accelerometer works with dual beamforming microphones to filter out background noise and ensure that your voice is transmitted with clarity and consistency. Additionally, they deliver five hours of listening time on a single charge, and they're made to keep up with you thanks to a charging case that holds multiple additional charges for more than 24 hours of listening time. Just 15 minutes in the case gives you three hours of listening time or up to two hours of talk time. Charge the case via a Lightning connector or take advantage of its compatibility with Qi mats (available separately) for true wireless charging. Box Dimensions (LxWxH) 17.8 x 9.75 x 1.35"